CMRB has great pleasure in inviting you to its Annual General Meeting on Monday 26th November, 4-5pm, EB.1.07, Docklands Campus, University of East London (all details in the attached flyer). The meeting is open to everyone who is interested in CMRB and/or wants to become involved in its activities as well as initiate new ones. We will discuss CMRB in the previous year and our plans for the coming year. CMRB’s Annual Review 2011/12 which can be found on the CMRB website: [direct link] . 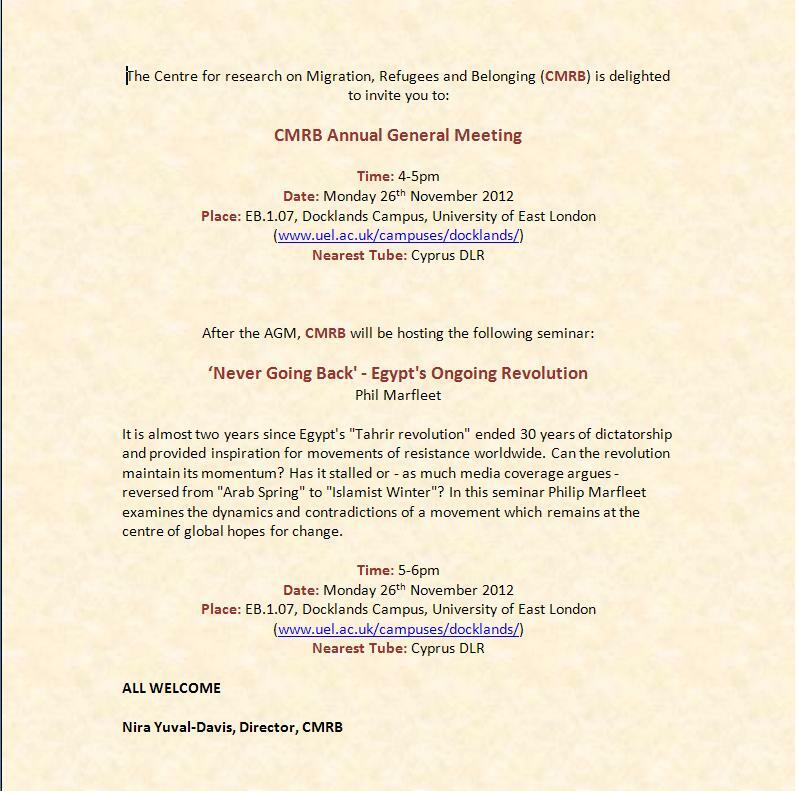 The AGM will be followed by a CMRB seminar: “‘Never Going Back’ – Egypt’s Ongoing Revolution” presented by Phil Marfleet. approach to witchcraft accusations and their prevention in refugee situations. UNHCR New Issues in Refugee Research, Research Paper No. 235. UNHCR New Issues in Refugee Research, Research Paper No. 236. Humanitarians without borders: work, mobility and wellbeing in UNHCR. UNHCR New Issues in Refugee Research, Research Paper No. 237. Israel: The injustice and secrecy surrounding administrative detention. Turkey: New Report On Women Human Rights Defenders In Kurdish Regions. The Current Status of Al-Qaida. By the Oxford Research Group. The Anatomy of Egyptian Revolution: From 25th of January to The New Constitution. UK: Migration Statistics Quarterly Report May 2012. By the Office for National Statistics (UK). Country Reports on Human Rights Practices for 2011. By the U.S. Department of State. Marginality and Exclusion in Egypt. A new book by Ray Bush and Habib Ayeb and published by Zed Books. A new book by Hamid Dabashi and published by Zed Books. Cyprus: Punishment without a crime: Detention of migrants and asylum seekers in Cyprus. ‘’Detention should not be a tool for regulating migration. Cypriot authorities are wilfully violating International and European Union law when they detain irregular migrants without examining alternative measures and demonstrating that their detention is indeed necessary,” said Jezerca Tigani, Europe and Central Asia Deputy Programme Director at Amnesty International. UNHCR Asylum Levels and Trends in Industrialized Countries: Statistical overview of asylum applications lodged in Europe and selected non-European countries. Frozen words: memory and sexual violence amongst Sudanese refugee women in Cairo. New Issues in Refugee Research – Research Paper No. 240. Improvements in Estimating Migration: Intelligence Update 12-2012. Produced by the Greater London Authority Intelligence Unit. (Source: The Daily Telegraph –Migrant population in some parts of England double previous estimate). Human Rights Watch World Report 2012: Events of 2011. Human Rights Watch Press Release. This 45-page report sets out nine areas of Egyptian law that the newly elected parliament must urgently reform if the law is to become an instrument that protects Egyptians’ rights rather than represses them. Egypt’s existing laws – the penal code, associations law, assembly law, and emergency law – limit public freedoms necessary for a democratic transition, challenge respect for the rule of law, and impede accountability for abuses by the police and the military. This 29-page briefing paper provides a snapshot of progress from Uganda’s complementarity-related initiative: the International Crimes Division (ICD). The ICD is a division of the High Court with a mandate to prosecute genocide, war crimes, and crimes against humanity, in addition to crimes such as terrorism. Based on research by Human Rights Watch in Uganda in September 2011, this briefing paper analyzes the ICD’s work to date, the obstacles it has encountered, and challenges both for the future work of the ICD and for national accountability efforts more broadly. This 63-page report documents the physical, sexual, and emotional abuse and persecution that transgender women – individuals who are born male, but identify as female – have faced at the hands of police. The report also documents the discrimination that transgender women have faced on a daily basis – including by members of the public – as a result of the law, an amendment to penal code article 198. Based on interviews with 40 transgender women, as well as with ministry of interior officials, lawyers, doctors, and members of Kuwaiti civil society, the report found that the arbitrary, ill-defined provisions of the law has allowed for numerous abuses to take place.